Hello, lovelies! October will be wrapping up soon, can you believe it? I can’t. For one thing, wasn’t it JUST September! And yet, here we are. No worries, because I have some plans to make any and everything count and turn my occasional frown upside down. This morning I cried about 10 seconds into hearing “I Smile” by gospel great Kirk Franklin. If you’re familiar the beginning lyrics start off saying, “Today’s a new day, but where are my blue skies? Nothing but clouds and it’s dark and it feels like a cold night.” By thd end of the first few lines I was bent over on my bed crying. I cried for a few things. I cried for feeling stuck AGAIN with my career path. I cried because the application I submitted this past Friday was strangely “reviewed” and a decision email made its way to me two days later on Sunday evening. I’m privy to the fact that employers nowadays have a computer system that sorts through resumes submitted online. To me that isn’t always fair. It felt so impersonal and too quick. The dreaded job rejection email is not new to me but I really wanted the job I applied for – bad! So this morning I woke up thanking God, but I was sad and I cried. The release happened as it needed to. I mean, I couldn’t keep it all in. The human instinct of a jumbled mind caught up to me and I cried. But I move forward. 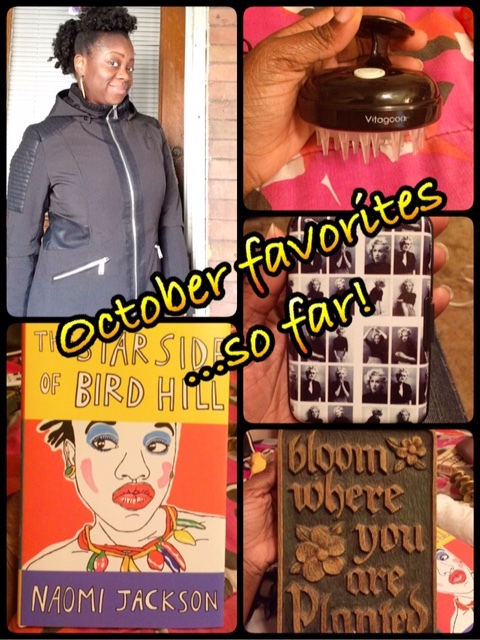 That brings me to my October favorites, so far. Though an emotional cry isn’t quite a favorite action to like per se, I am feeling gratitude within myself for trusting my feelings. Beyond the cry this morning I have some actual items that are favorites of mine as well. Below is a brief description of the items shown in the image above! BCBGeneration hooded jacket- I purchased this jacket this month of October and I love it. I snagged this stylish jacket for $79.99 at Burlington Coat Factory. Perfect for fall, its leightweight but the warm lining and hood is helpful on a chilly day. Motivational plaque- While visiting my grandmother this past August in Ohio we visited a thrift store. The olive green sign that reads in bronzed letters, “Bloom where you are planted” was all but $2.99! Inspirational and inexpensive. Scalp massager- With the advice from a fave YouTuber I like to watch (BlakIzBeautyful), I decided to purchase a scalp massager by Vitagoods. Powered by a battery the handheld tool vibrates and gently massages the scalp, lifts up dryness and helps with moisture and hair growth. You can find it at vanityplanet.com and use Jenell (BlakIzBeautyful)’s coupon code: jb4scalp for 50% off! Marilyn Monroe– I found the business card case for $2.99 at Rainbow some time in September. I love the black & white images of Marilyn, an array of expressions and poses. It can even be used to hold miscellaneous cards from a wallet. The Star Side of Bird Hill tells the story of two young sisters Dionne and Phaedra who go from living in Brooklyn to Barbados after their mother can no longer care for them. The setting is 1989 and the girls encounter their families culture with their grandmother and their new life in Bird Hill, Barbados. This is my next novel to read and I’m excited to see how the story will play out. This novel is written by author Naomi Jackson. Please be sure to check out the Labels, Love, and Living pages for some more content for this month!